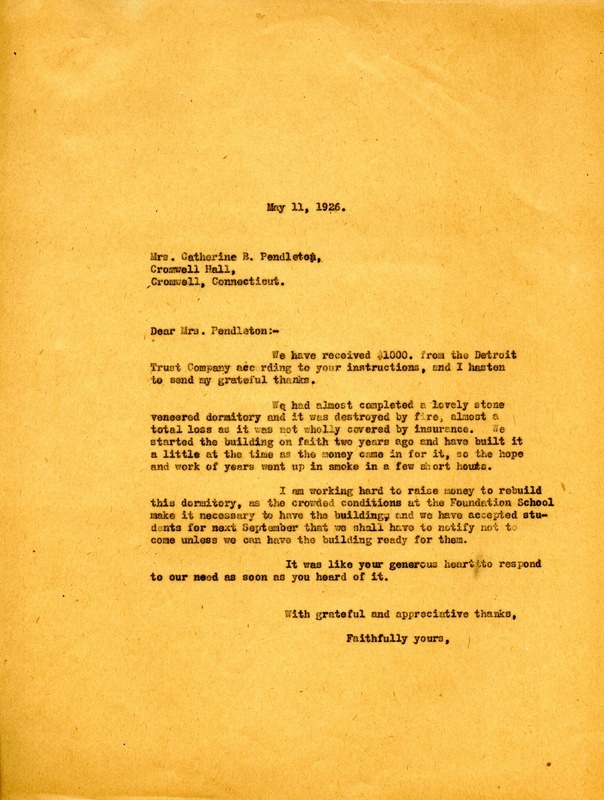 Martha Berry writes Catherine B. Pendleton to express her thanks for the $1000 received from the Detroit Trust Company per her instructions. She goes on to talk about a dormitory destroyed by fire and not fully covered by insurance. She expresses a great need for a new dormitory due to the crowded conditions at the Foundation School. These conditions, she claims, will force her to turn away accepted students in September if the new building is not yet complete and ready to house them. Martha Berry, “Letter to Catherine B. Pendleton from Martha Berry.” Martha Berry Digital Archive. Eds. Schlitz, Stephanie A., Chelsea Risley, Lindsey Purvis, et al. Mount Berry: Berry College, 2012. accessed April 24, 2019, https://mbda.berry.edu/items/show/3073.